Jake Broder in His Royal Hipness Lord Buckley. Photo by Vincent Scarano. 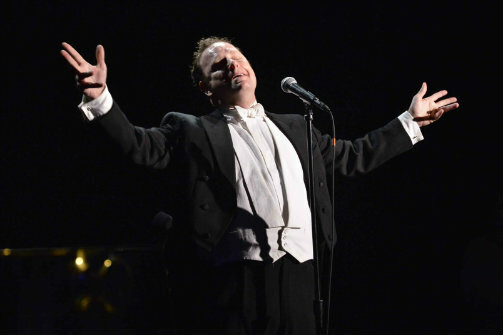 BOTTOM LINE: Actor Jake Broder channels the spirit and language of comedian/monologist Lord Buckley (1906-1960) in a biting comedic rant that tackles a host of contemporary political and social issues. It's significant that 59 East 59th Street—the site of the Off Broadway production of His Royal Hipness Lord Buckley—is just 1047 feet from Trump Tower. In fact, it gives Jake Broder, the tuxedoed actor-playwright who portrays the long-dead performer, a hook with which to elaborate on the sorry state of U.S. politics. Indeed, the startling proximity gives Broder the pretext he needs to reflect on race, class, militarism, consumer culture, and love, all of it steeped in the language of 1940s and 50s hipsters, Beats, and rebels. Men and women are cats and kitties and the performers—in addition to Broder there is Michael Lanahan as MC, newscaster from the Hip News, and Abraham Lincoln—are “flipped and grooved” to have landed on stage. It sounds quaint, at least until the actual content spills forth. The theater is set up to resemble an intimate club, with audience members sitting at small tables. The stage is bare save for a three-piece jazz ensemble (the excellent Mark Hartman on piano; Brad Russell on bass; and Daniel Glass on drums) and Broder stumps from a centralized mic to deliver his fast-paced commentary. Topics include the development of jazz; the passive resistance of Mahatma Gandhi; the wit and wisdom of Walt Whitman; the spirit of Christmas; racism; and, of course, the threat posed by the presumed President-elect. Interspersed with Broder’s riffs are commercial interruptions—think Grand Ole Opry but with leftist politics and you’ll get the idea. “It’s now official,” Lanahan offers in one Hip News segment, “The government of the U.S. has declared nuclear war is no longer a threat to the American citizen. They have issued a pamphlet entitled, Nuclear War—You Can Survive. Remember America, the more you spend, the safer you are.” It’s funny, in a gallows humor kind of way. Missing, however, is any sense of Lord Buckley himself. That is, Broder does not say anything about the character he embodies and audience members who know little-to-nothing about the Good Lord B will be forced to take a trip to Wikipedia. There, they’ll learn that Buckley is credited with inspiring a host of stand-up comedians, writers, and musicians including David Amram, Lenny Bruce, George Carlin, Bob Dylan, Whoopi Goldberg, Arlo Guthrie, Richard Pryor, and Robin Williams. They’ll also learn that the New York Police Department revoked Buckley‘s Cabaret Card in 1960 because of a 1941 arrest for marijuana possession. This meant that he could no longer perform publicly—the same fate that derailed Billie Holiday’s career. Several months after losing his Card—which essentially left him unable to support himself—Buckley died of a stroke. He was 54. For a nanosecond, the audience joins Broder in sharing the vision he presents: “One day the country will rehearse love so hard that every cat and kittie, red, white, and blue, will be swinging it together, level.” As the band plays a finale of When the Saints Go Marching In, the idea that love is all we need takes hold and seems true. It’s a unifying moment, however fleeting. His Royal Hipness Lord Buckley is by Jake Broder. Directed by David Ellenstein. Stage Manager is Norah Scheinman. Light and Sound Design by Aaron Rumley. On-Stage band members are Mark Hartman, Brad Russell, and Daniel Glass. The cast is Jake Broder and Michael Lanahan.